Columbia Heights Budget Engagement Forum Well Attended | Park View, D.C.
Full house at the Feb. 27th Budget Engagement Forum. 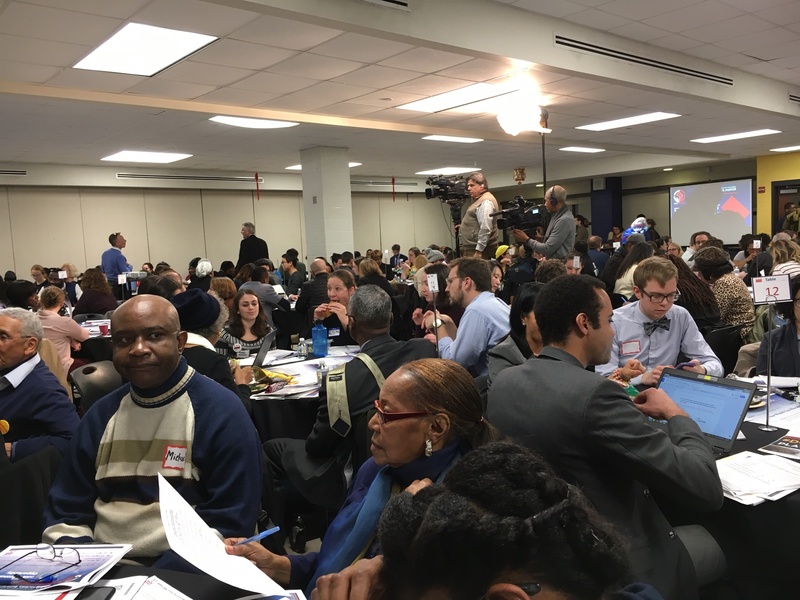 The third and final budget engagement forum was held last night (2/27) at the Columbia Heights Education Campus and was very well attended. The meeting was organized as a series of round tables, each with a facilitator. The goal of the discussions were to come to some consensus on how much of the Districts operating dollars should be allocated to six key areas — Housing; Public Safety; Government Operations; Retirement Costs & Other; Jobs & Economic Opportunity; Education; and Health & Human Services (chart below shows current allocations). Each participant was given a form with the budget areas and asked to allocate $100 to each of the six areas to show their priorities. After this exercise, the same information was discussed in each group with the highest allocation documented on a separate sheet. In my group adding these number up came up with a total of $140 ($40 over budget). This followed with the group then discussing how to reduce allocations in some areas to balance the total to $100. Overall, to me, the most value in the exercise was listening to each participant explain why there were giving some categories higher allocations than others. I advocated for money for Education because teachers have not had raises or even cost of living increases in a while and because parks and recreation improvements also fall under the education umbrella. One member of my group was advocating for decreasing the public safety allocation as they see the police as reacting to crime rather than addressing causes of crime (which may be addressed through other budget areas). 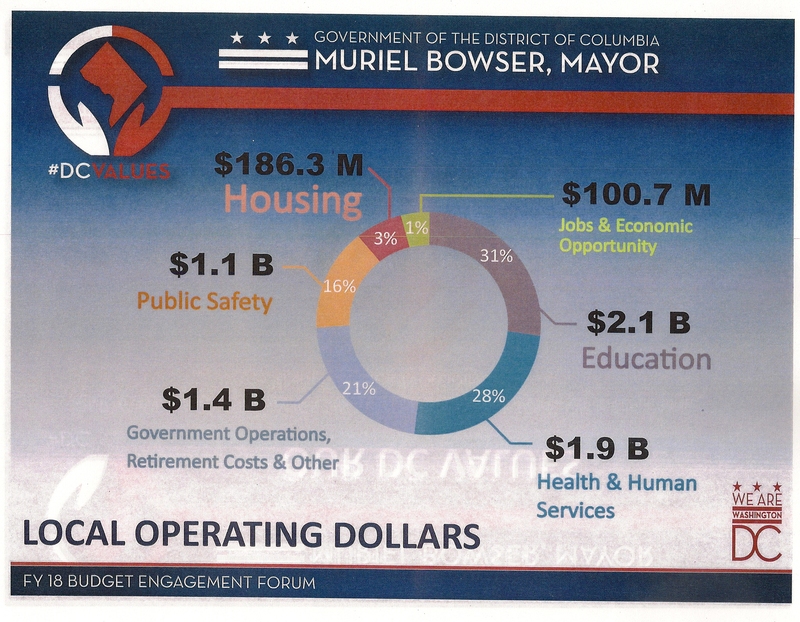 While the forums can help the Mayor decide how much of the budget needs to go to these priorities, the real opportunities to advocate for specific needs will be at the coming DC Council budget oversight hearings. This entry was posted on February 28, 2017 at 7:01 am and is filed under Community Involvement, District Budget, Government. You can subscribe via RSS 2.0 feed to this post's comments.